The best concert I've ever seen of Eric Clapton... Bell Bottom blues is my favorite, I keep on repeating the song...soooooo great...!!!! The one that definitively convinced me about Eric. Great shot of "Have U Ever Loved A Woman", "Change The World" , "My father's Eyes" and "Wonderful Tonight". My favourite is "River Of Tears" with its amazing solo, it touches my heart each time I listen to it. The other stuff is quite good, sound and mix is perfect to me. This is a fantastic album and an even better DVD. The one key emotional song/solo you should hear is "Have You Ever Loved A Woman" which is chocked full emotion. If you really listen, you can hear the guitar talking to you. There are certain songs that gives me goose bumps when I listen to it, and this is one of them -- even thought I've heard it a million times. Some prime stuff, but not everything. Out of the acoustic set I like Key to the highway and bell bottom blues. (The later in its best version ever). Change the world is just normal to me and Tears in heaven are better sung on Unplugged, where I love this. The instrumental makes good mood and Pilgrim stuff is better than in studio. I love the intro and soloing on My fathers eyes and River of tears done bluesy is just GORGEOUS. Going down slow is nice too. She s gone is way more rocking than in studio version. Got you on my mind is "just decent" I was pleased to hear Sunshine of your love which Eric doesn't play too often. BUT LAYLA IS IN BEST VERSION I HAVE EVER HEARD. HARD? POWERFUL, GREAT. It features a prime guitar solo. CD 2 disappointed me. Except for Hoochie Coochie man and Cocaine with great guitar and organ solos. Have you ever loved a woman is the worst track on here. Nearly no guitar at all here and horribly low singing. I can not believe this is the same track as on E.C. was here. Badge is too poppy and too extended. I liked it way more shorter and rocking on Rainbow concert Cd. I want a little girl is just fifties stylized horror. Over the rainbow has at least a fine vocal performance. And about Wonderful tonight. Why did they have to put the saxophone solo in or whatever it is? It makes sounding it like bad jazz. If this was just one CD featuring tracks 1, 5, 6, 7, 8, 9, 10, 13, 15, 17, and 18, (Counting out of both CDs) it could be a BIG 10. It took me awhile to get to like and appreciate this album. I had to really watch the DVD and see him playing in order to appreciate it. I hadn't even listened to all the songs but once I watched them I don't even watch Cocaine, Wonderful Tonight or Layla anymore. I think the best song on this album is My Fathers Eyes, he plays fluidly and quite well. He also plays the best version of River of Tears, much better than the original album version. He also plays a great Have You Ever Loved a Woman, although I think he should have taken the soloing during the middle too, he always plays great versions of that song and I think he could have made this one even better had he taken a solo. The best song, which is only on the DVD is Will it Go Round in Circles, a Billy Preston song, Billy actually gets up and dances during the middle of the song, and it seems as though Clapton put more effort into the solo on this song than on say Layla! I still think its a great album, definitely worth buying. And get the DVD!! This is, in my opinion, the best EC live album of his storied career. His voice just keeps getting better and his guitar work has never been more precise and soulful. "River of Tears" is quite simply awesome. "Have You Ever Loved A Woman" is fantastic; his best version of this classic to date. "Hoochie Coochie Man" just knocks me out. 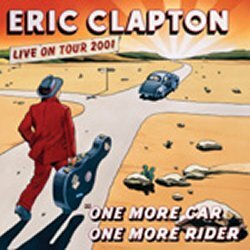 This album is Eric's absolute best and he's backed by the best band he's ever played with: Billy Preston is amazing, Steve Gadd's chops are outstanding (the best drummer on the planet), David Sancious is unbelievable, Nathan East is superb (as he always is), and Andy Fairweather-Low is great. Be sure to get the DVD as well...it is killer! Thanks, EC, and God bless! I was able to see EC a couple of nights before the performance in LA at the Staples Center. Having seen Clapton several times before and not seeing many Derek and the Dominoes songs performed, I was able to enjoy this record. The CD starts off very strong with several acoustic numbers, especially his rendition of Key to the Highway. This to me was the gem of the evening. It also includes Bell Bottom Blues, Tears in Heaven and If I could change the World. He goes on to do "My Fathers eyes and "River of Tears"
These renditions though good were not as good as his Pilgrim concert performances. He does songs off of Reptile, however they are not the best songs on the CD. "Got you on my mind however deserves a listen. He goes on to do a very tired rendition of Badge and the Classic "Cocaine". Hoochie Coochie man and Have you ever loved a woman satisfy my sweet tooth for blues. He then goes into the standard "Wonderful Tonight with David Sancious doing a unique solo. Not as strong as the version on 24 nights, but very good. He then does "Layla and the Cream classic "Sunshine of your Love" which is the best live version I've heard him do. Eric has the audience buzzing and slows the tempo down with the Wizard of Oz classic "Somewhere over the Rainbow", which blew me away. He uses a Jazz chord progression and turns the song into his own, much the way Ray Charles did it in the Movie "Sleepless in Seattle. to me this is a gem and shows a side of Eric I rarely see. All night long his virtuosity is evident and his guitar cries while playing the blues. I would recommend this CD to anyone and especially an Eric Clapton Fan. May Eric live to record many more CDs for us die hard fans. In Summer of 2001, I saw Eric Clapton play at the Staples Center in Los Angeles California on August 18. I've seen a lot of concerts in my day, I saw Eric Clapton play with the Cream twice; I saw Jimi Hendrix three times; I saw the Allman Brothers Band; Bruce Springsteen and E-street band (with Dave Sancious); The Rolling Stones. When I saw the Clapton concert, I thought it was the greatest concert I've ever seen. Eric does an amazing jam of "Reptile," with great solos by Billy, David, and EC himself. "My Father's Eyes," is amazing, powerful, and a hell of a lot better than the studio version led by a drum machine, (If you didn't like the studio version, or kind of liked it, You'll be blown away by this version) "Tears in Heaven" is sad, but beautiful. "Badge" is rocking and fun as is "Cocaine," "Hoochie Coochie Man," and "Have You Ever Loved a Woman." Finally we come to the moment we've all been waiting for, "Layla!" Eric keeps you in suspense until he finally plays the beginning 7 notes of his world famous lick, and the crowd goes wild, including me actually in the audience. It does lag a tiny bit, but it still holds strong and the ending is beautiful. Eric turns his back to the audience almost as if he's paying homage to Duane Allman and Carl Radle. They go off stage for a break and come back on as Billy Preston takes the lead vocal for "Will it Go Round in Circles," and EC, Andy Farweither Low, and Nathan East all take lead vocals for "Sunshine of Your Love." "Over the Rainbow," is such a great way to end the concert as Eric plays it like no other has ever done. Once I left that concert I had wished I could have seen it again. It was so amazing. Then exactly one year later, I was amazed to see that Eric had made a DVD of the exact same concert I was at. I watched it over and over again looking for myself in the audience always realizing "I was there at one of the greates concerts ever!" CD 1: I start listening to this album with slight trepidation, after what some of the other writers had commented, I feared the worst after the simple and pointless? 'Key To The Highway', and the Jazzy/Waltzy am I now in a restaurant? 'Reptile' phew!? Is this the same guy as on my 'Time Pieces' album? Eric ends 'Reptile' with a thank you, well at least he appreciated that I hadn't knocked off my CD player. To my relief things then start to pick up with a rousing rendition of Joe Turner's 'Got You On My Mind', and things get better yet with a lovely 'Tears in Heaven', mind a little off key and the voice is going walkabout. 'Bell Bottom Blues', 'Change The World' and 'Fathers Eyes' find Eric in finer fickle. 'River Of Tears' is not a classic here and at 9 minutes is an endurance test but Eric lifts the spirits back with 'Going Down' and a rocking 'She's Gone'. Well I made it through the first CD, it wasn't that bad, I enjoyed it in parts without actually really feeling it or getting into the groove. Good but no lasting impressions. CD 2: Ah from the credits I see I recognise a few more on this CD. I'm feeling brave! I've had my can of 'Red Bull' and I'm going to get straight into this one. Well Eric certainly doesn't want to create an exciting opening with 'I Want A Little Girl' (I hope they had seats on hand for this one), 'Badge' is more like it (should have been track one!) some brilliant guitar playing (isn't that Eric's forte?) and Eric seems to be enjoying things a bit more too, straight into 'Hoochie Coochie Man' a classic track, albeit not played to its full potential, Eric brings me back down with a draining 'Have You Ever Loved A Woman' but doesn't leave me there too long (mercifully) with professional if slightly tired sounding versions of undoubted Rock gems 'Cocaine', 'Wonderful Tonight' and 'Layla'. 'Sunshine Of Your Love' is one of the strongest tracks over the two CDs where both Eric and the band seem to have a second wind and are playing with a little more passion and, dare I say, life!. But 'Over The Rainbow' is a childish, self-indulgent turn which should be left to the likes of 'Des O' Connor' to knock at the end of one of his chat shows. A good album that would have been better had they cut the filler and squeezed the best onto a single album. I may be inexperienced (compared to many Blues fans) to the sounds of Eric but from the early albums I have heard I realise that this isn't Eric Clapton at his best. It's hard to recommend this one to anybody who likes Eric Clapton since you've probably got these songs already and played far better. One ride too many, this car needs a pit stop. When I first heard the record I thought it was awesome, but as you keep listening to it repeatedly you find that other than 'river of tears' and 'have you ever loved a woman' the other songs don't have as much soul. I think it would have made a much better record if he had taken songs from the south American leg of the tour, specially from Chile, his performance here was beyond any other I've heard from the tour his soloing was marvellous, I think it was his 11 year absence from this country that might have given that energy, anyway he should make a record from that particular concert. I gave it an 8 because it still is a great record, but Slowhand CAN do best. After seeing Clapton in Helsinki. Wow the best I have ever seen him, the selection, the band the passion, never liked Pilgrim much but live ...fantastic. Though some of the ambience is missing on the album it takes me straight back to the Helsinki gig, a definite 10 just for Hoochie Coochie Man, even if the fire is missing on Layla. I attended the better one of EC's Helsinki concerts, and I've also heard some bootlegs from the tour. Considering how amazing EC was during many concerts during the tour, this record is partly disappointing. Disc One is good, with some inspired soloing during the Pilgrim mini-set, but Disc Two is very disappointing. For some reason there are very many keyboard solos and very few guitar solos on the second disc. I cannot understand why from this tour which included some amazingly superb highlights, such a mediocre set has been chosen for Disc Two, where the intros to Layla and Have You Ever Loved A Woman are the only really inspired moments. The low point is probably Cocaine which was so superb in Helsinki, but seems completely uninspired on this record. I give Disc One the rating 9 and Disc Two the rating 5. Maybe my rating is so low because my expectations were particularly high, since EC was truly divine during the high points of the tour. This album shows how EC is a magnet for great talent, with the likes of Nathan East and Billy Preston accompanying him. EC manages to play more notes than the London Symphony Orchestra single handily on "Key To The Highway". Throughout the album he shows how natural his talent is, looking constantly at ease. He really seem to enjoy playing on the DVD. River of Tears justifies it's title as the listener gets the impression of tears pouring from Clapton's old heart as he plays. EC achieves on this album what he manages in every live show and that is a different slant on every song. I've heard all of these songs before but somehow EC changes them on stage; he makes them something more, this is something so many artists lack, they just come on stage and play in exactly the same way they would in the studio; now what's the point in that. EC also shows his natural ability for making up music as he joins two completely separate songs together seamlessly. This album is also indicative of EC's eclectic style. How many other artists have songs as diverse as Sunshine On Your Love (which incidentally shows Hendrix a thing or two) and Wonderful Tonight. EC truly is not only the world's greatest guitarist, he is also a very fine song writer. What a great album first disc, one word amazing "Key To The Highway" good way to start the CD "Reptile" powerful solo by Billy Preston. "River Of Tears" great long solos by THE MAN. On to disc two, "Badge" is a great tribute to the late George Harrison. "Have You Ever Loved A Woman", Eric puts his heart and soul into this one. "Layla" is good but the solo is OK, and last but not least, "Over The Rainbow". What a great way to end the CD! Thanks again Slowhand!